What Has Your Overdraft Provider Done for You Lately? BSG Financial Group, a leading provider of revenue-enhancement programs and compliance solutions for financial institutions nationwide, will present a webinar on Thursday, March 9 at 2 p.m. EST entitled "What Has Your Overdraft Provider Done for You Lately?" 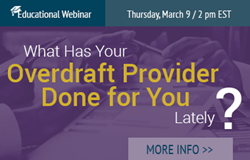 The free webinar—which is part of an ongoing educational series that the company provides for its clients and potential customers—will present evaluation criteria and key metrics to help attendees assess their current overdraft service provider relationship and overdraft program performance. The webinar is also relevant to institutions that do not currently utilize an automated overdraft solution or are considering adopting a third-party solution, as they will learn the 'must-have' elements of a compliant, consumer-focused discretionary overdraft service. During this 60-minute webinar, industry expert Erik Hoghaug of Hoghaug Consulting, LLC, will provide a 'road map' to evaluating an overdraft provider in critical areas, such as technology advancements; program costs; customer requirements; and ongoing support & program evaluation. The company's additional revenue-enhancing solutions include: Fee-Based Packaged Checking Accounts; Digital Lending Solutions; Vendor Management; Account Acquisition Strategies; and Social Media Management.